We are not afraid or ashamed to speak about faith, morality, and right and wrong, but we are not parochial in our views. Some of you may be concerned about attending a Catholic and Jesuit institution. You might fear that we have modified our curriculum in some way to reflect the views of the Church or the Society of Jesus. Or you might think that we will try to change your present religious belief. In fact, The Society of Jesus, Marquette University, and this Law School are absolutely committed to the core concept of academic freedom and to a full dialogue on every and any issue. Indeed, it is my experience that a broader exchange of views is possible here than at many institutions that are constrained by "political correctness." We are not afraid or ashamed to speak about faith, morality, and right and wrong, but we are not parochial in our views. We welcome persons of all backgrounds, religious and non-religious, to our Law School. Law school must be an enriching experience, and part of that enrichment is meeting and learning with people from diverse backgrounds, cultures, and religious traditions. We embrace a diverse student body as being essential to a first-rate legal education and a superior law school experience. We are blessed with an outstanding faculty. The first prerequisite for our faculty is outstanding teaching. 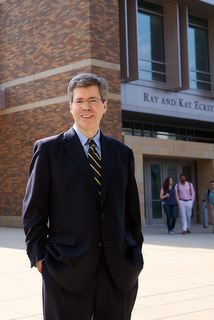 Teaching is not a secondary concern at Marquette; it is the primary qualification for hiring, promotion, and tenure of faculty. To maximize the formal classroom experience we limit the size of classes and provide a mix of gifted full-time faculty and outstanding adjunct faculty from among the best lawyers in the state. Law faculty and administrators are accessible to students to discuss course material, legal issues, career goals, or personal matters. The Jesuit commitment to care for the person is reflected in the way we view students, and how we expect students to view themselves and each other. Our main job is educating you to be highly skilled, highly ethical, and moral lawyers and human beings. That requires that we be available to you in and out of the classroom. There are many fine law schools in the United States. However, I doubt that many schools can offer you the outstanding education, true caring for you as a person, and the commitment to make you a better person while you are here. We hope you will give our Law School your serious consideration.